Want to play with the NSYO as a Featured Soloist? Enter our Concerto Competition! 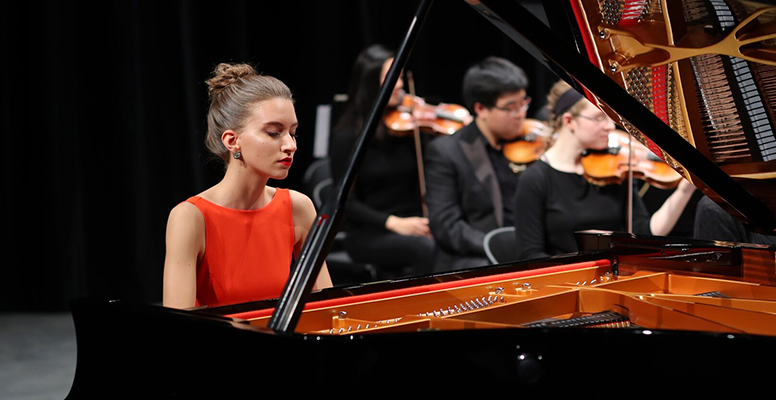 The 2019 Nova Scotia Youth Orchestra Concerto Competition is open to any instrumentalist or vocalist aged 22 or younger by the deadline, who currently resides in or maintains a permanent residence in Nova Scotia. Present members or alumni of the NSYO are also welcome to apply, regardless of area of residence. A recent recording (no older than six months) of a standard concerto (preferably a minimum of two contrasting movements) or a group of operatic arias. It is highly recommended that the material you submit is of sufficient length to show variety, i.e. a mixture of rhythmic and lyrical playing, etc. as opposed to exclusively fast or exclusively slow music. CD recordings or digital recordings only please. Two reference letters from recognized professional musicians supporting the application. The competition will be judged by an independent jury, who will select a winner to perform with the NSYO during the 2019/20 concert season. The winner will be announced at the NSYO’s April 28, 2019 concert in Halifax. For more information, please contact Kyrie Robinson at KyrieRobinson@symphonyns.ca.